Scroll down to learn more about how you can save the Irem Temple Building or click below to donate today. The Irem Temple is the most spectacular Shriner’s Temple in the world, saving it will provide a substantial lift to our local economy. 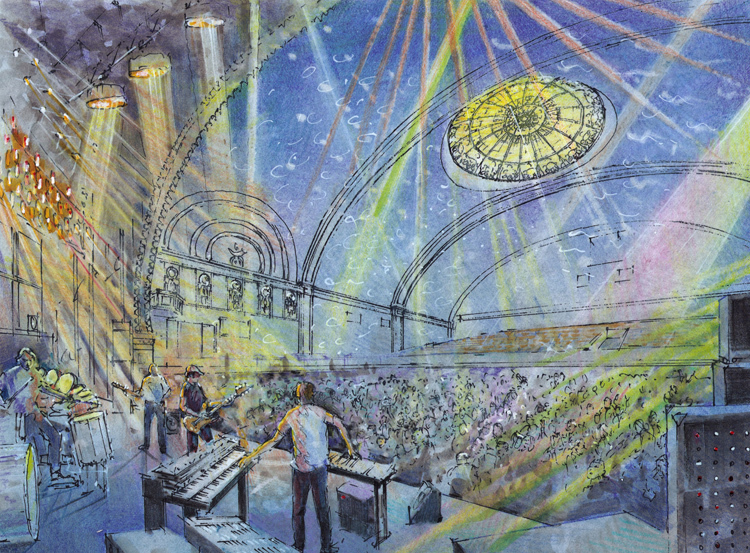 The main auditorium will be returned to its original configuration — a flat-floored hall. 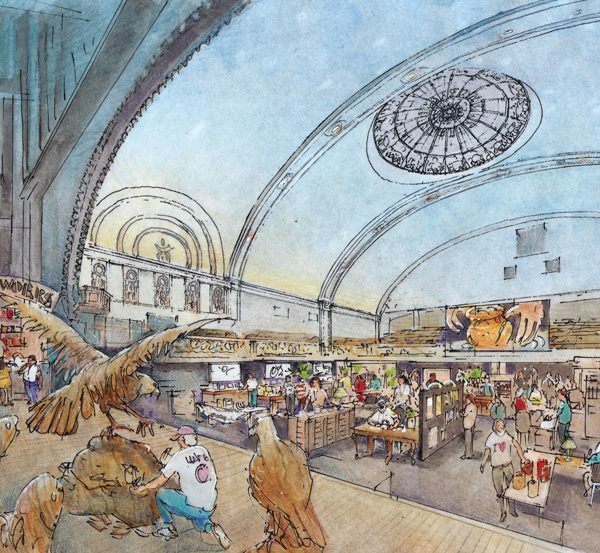 This would create a multi-use event space, allowing for everything from weddings to farmer’s markets and ring-based sports. It would allow our community to attract the 50% of touring acts that demand this configuration (no seats on the main floor) and be synergistic with existing downtown venues. 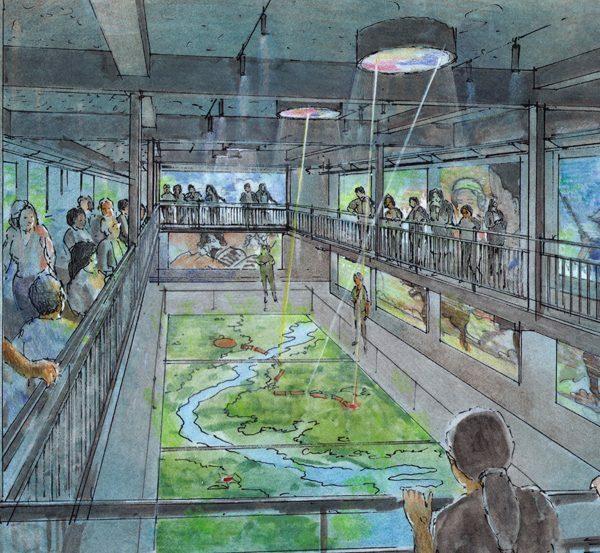 The rest of the building will be a museum that speaks to the revolutionary history (American and Industrial) of Wilkes-Barre and the Wyoming Valley. Heritage Tourism will be a broad-based driver of economic growth in this community and saving this building is the best next step. The Irem Temple building in Wilkes-Barre is a national treasure and the nation’s most significant example of Moorish Revival Architecture. With its four towering minarets and large stained-glass dome, the building is unlike any other Shriners auditorium in the world and was the crown jewel of Wilkes-Barre for over 60 years. Construction on the building began in 1907 and the building was dedicated in December of 1908. 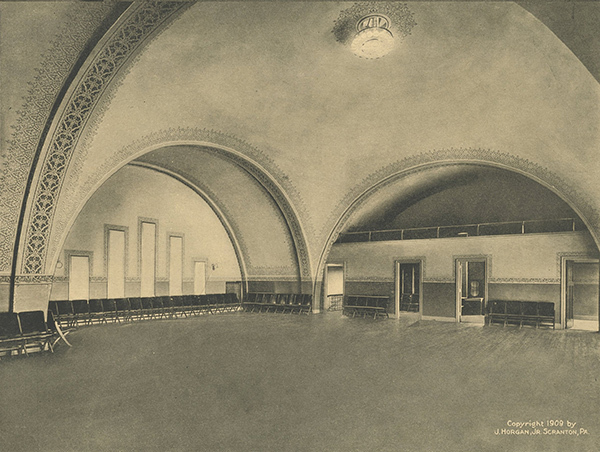 In 1931, the flat floor of the main auditorium was replaced with a sloped floor, auditorium seating, and a stage. The building was the primary performing arts theater in Wilkes-Barre for much of the 20th century and hosted various ritual and social events for the Irem Shriners and the community at large. 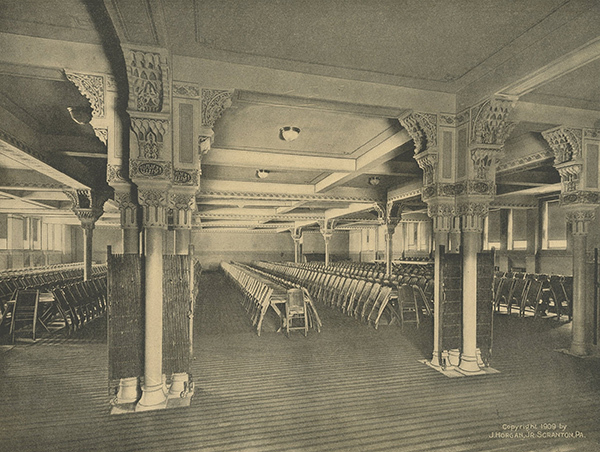 Thousands of local residents celebrated weddings and graduations or attended orchestra performances and theater productions within the ornamental Main Hall. The Wilkes-Barre Fraternal Order of Police held their annual fundraiser in the Irem Temple building and the radio show “Welcome Travelers,” hosted by Tommy Bartlett was broadcast live from the stage. Sadly, once newer and better equipped seated-theaters, such as The F.M. Kirby Center, entered the area, the Irem Temple Building was forced to close its doors. In 2005, the building was bought by the Greater Wilkes-Barre Chamber of Commerce, who had plans to preserve and revitalize the building. The preservation began in 2008 with critical roof repairs that saved the building from irreparable damage that would have ultimately resulted in demolition of the building. However, following the 2008 financial crisis, the Chamber of Commerce was not able to continue restoration of the building. Today, the Irem Temple Building is listed as part of Wilkes-Barre’s Riverfront Historic District on the National Historical Registry; a designation that requires rigorous evaluation to determine historical places that are worthy of preservation. Now, the Irem Temple Restoration Project, in partnership with key community organizations, are offering this exquisite, one of a kind Shriners auditorium a second, and final, chance at restoration. The purpose of the Irem Temple Restoration Project (ITRP) is to restore the Irem Temple Building as part of the ongoing revitalization of downtown Wilkes-Barre. The building’s thousands of square feet of usable space will serve two main purposes. 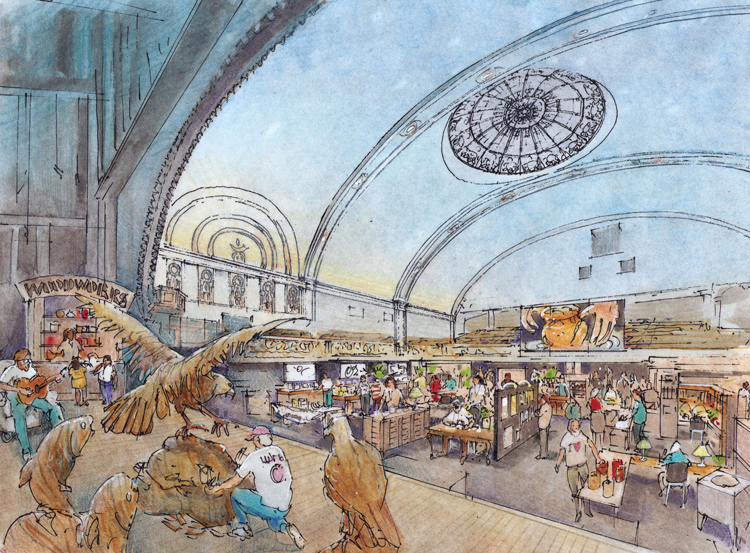 By returning the first floor Main Hall to its original configuration and leaving the stage and balcony unchanged, it will be an event and performance space unlike anything in Northeastern Pennsylvania. 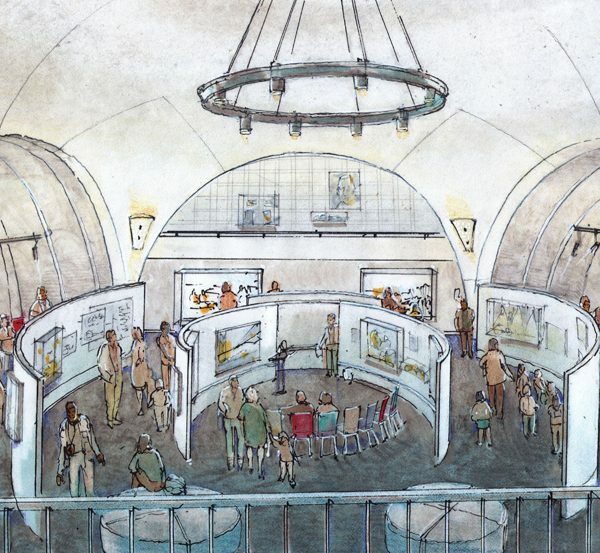 The remaining 18,000 square feet of usable space will be turned into a 1st-class museum/virtual-learning experience focused on the amazing history of Wyoming Valley and Wilkes-Barre. 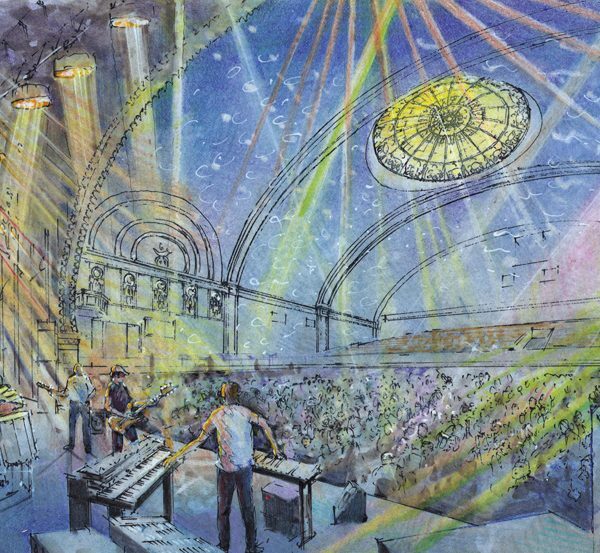 With 6,000 square feet of indoor, chair-free space, the Main Hall will offer a unique performance space from other venues in the area and will attract performers that have previously not performed in downtown Wilkes-Barre. Many heavy metal bands, jam bands, and electronic dance music performers now prefer, and in some cases demand, no-seat, general admission venues. This configuration positions the most enthusiastic fans at the front of the stage and allows them to generate excitement for the rest of the crowd. Additionally, this type of admission permits more affordable ticket prices which ultimately draws bigger crowds. In the case of the ITRP, which is situated directly between two colleges and close to several others, affordable tickets will be especially appealing for college students and will draw them to concerts on a regular basis. 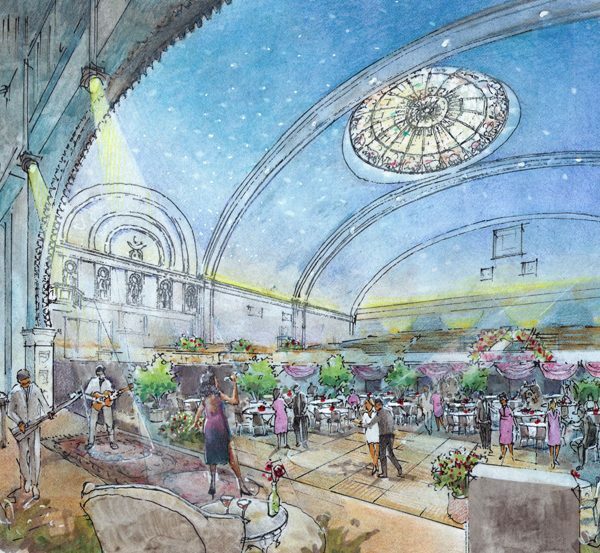 Weddings and Banquets will also make up a large portion of events held in the Irem Temple Building. 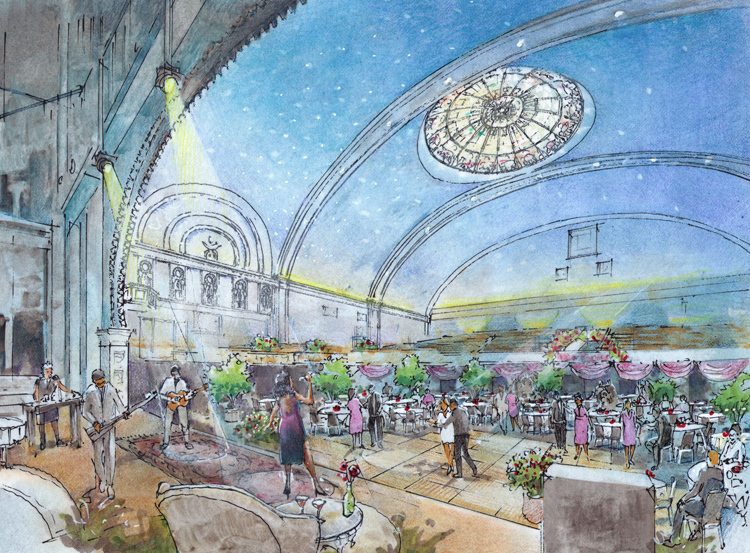 The Main Hall will accommodate over 400 guests for weddings or dinner theater style events with room for a large dance floor. While additional wedding venues already exist in downtown Wilkes-Barre and the surrounding area, few offer a comparable amount of space, making the Irem Temple Building a unique contributor to the local wedding industry. As of 2013, the wedding industry generated $53.4 Billion and since then, the industry has continued to grow as the economy improves and unemployment rates decrease. The ITRP plans to partner with local vendors to extend the overall economic benefit of accommodating weddings to the entire community. 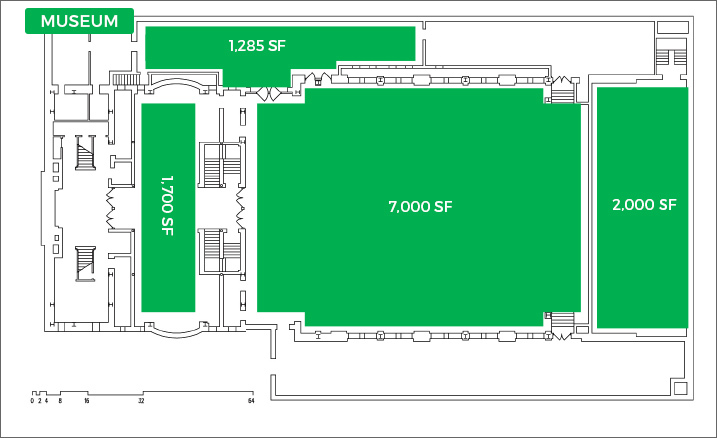 With thousands of square feet of modifiable space and various size rooms among its four floors, the building will also provide venues for small events/group rentals, ring based sports, theater in the round, markets, conventions, and vendor shows. 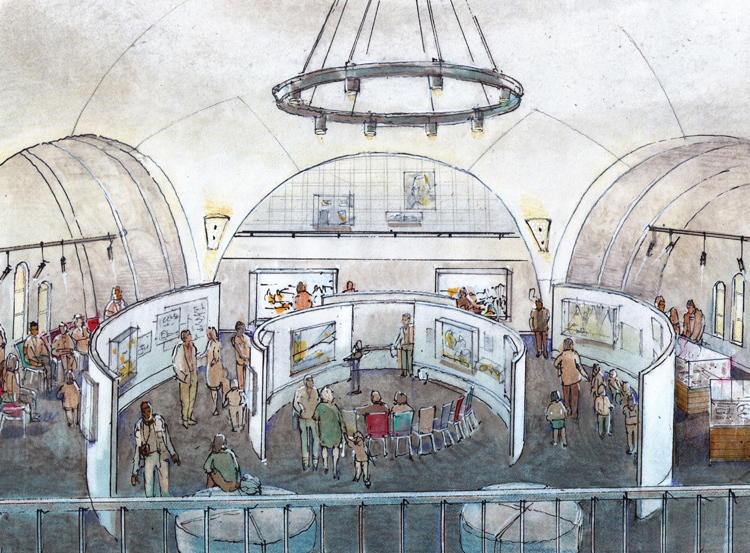 The Dome will serve both as a museum and a small event space, allowing the community to hold events in which guests are literally surrounded by local history. 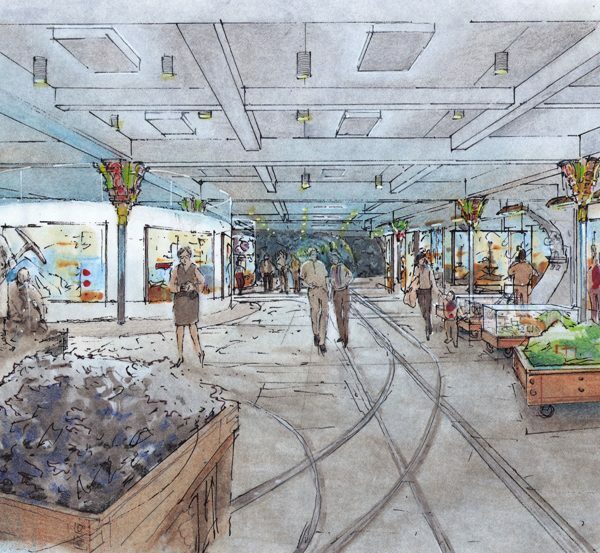 Again, artifacts and pictures will line the walls and floating display cases will be placed throughout the space. 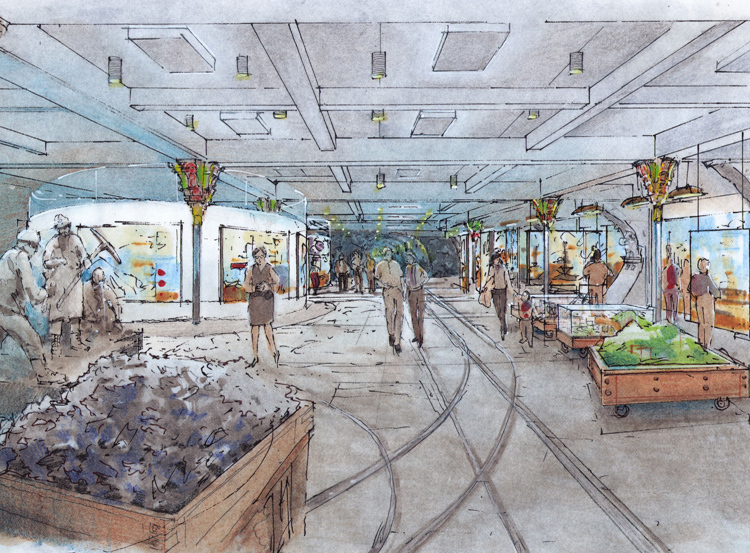 The display cases will be on wheels, so the museum exhibits can be reoriented to fit the type of event and amount of space needed. Located in the basement, what was once the locker room will be transformed into a dynamic, virtual experience, that begins with guests surrounding the balcony on the 2nd floor and looking to the at first, empty floor below them. They will watch as the floor is transformed into an interactive map and timeline highlighting key places and events in our history. Once the captivating virtual performance is complete, the lights will rise and reveal two floors of pictures and artifacts providing further insight into key places and events. The main room in the basement will provide two more unique ways to experience the area’s history. On the left side of the room, important cultural and historical artifacts will be arranged on mobile stands, flat panel televisions will line the walls playing brief documentaries, and interactive digital kiosks will provide more information on specific events. All of the displays will be easily transported to ensure they can be moved in less than an hour in the event of rising flood waters. 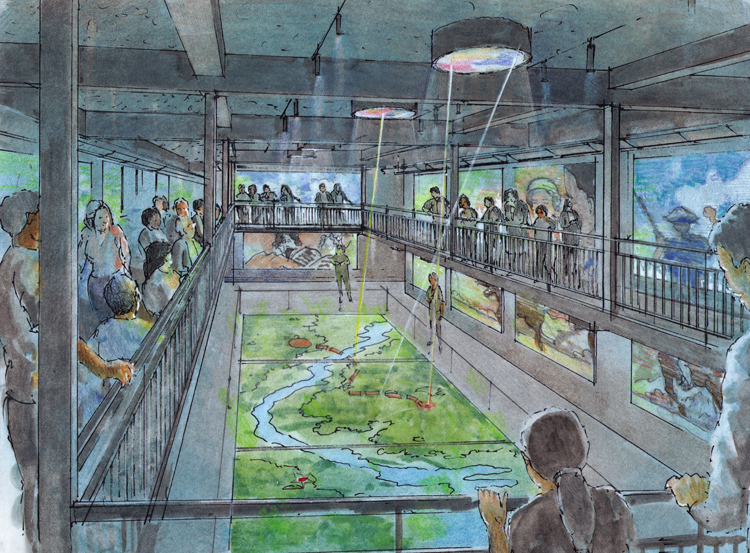 The right side of the room will contain two circular immersion booths that will provide first-person, 360-degree simulations and recreations of important historical events. Imagine bringing a classroom into an immersion booth and suddenly the students have left the museum and are now soldiers in the Battle of Wyoming or a miner trapped in an anthracite coal mine. Genuine partnerships with local organizations, Native American tribes, and Revolutionary reenactors will allow the ITRP to create these experiences. The seats will be removed in the 6,000 FT main hall. The floor will be returned to its original flat configuration. It will host a wide variety of events. 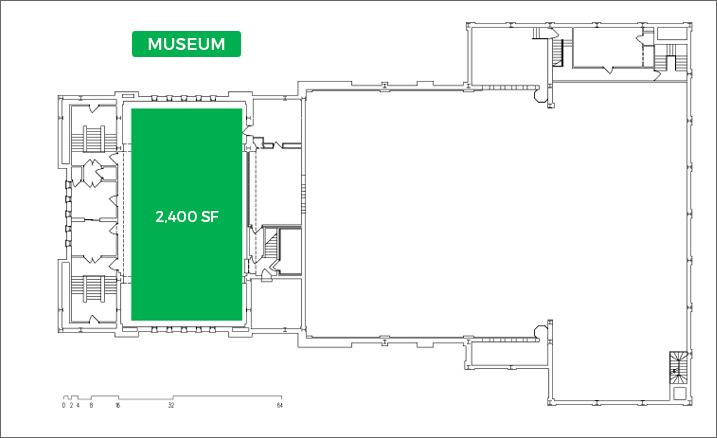 Rooms in the front of the building will serve as offices and museum space. Main hall could accommodate 400+ people during a wedding or dinner theater/cabaret style event. 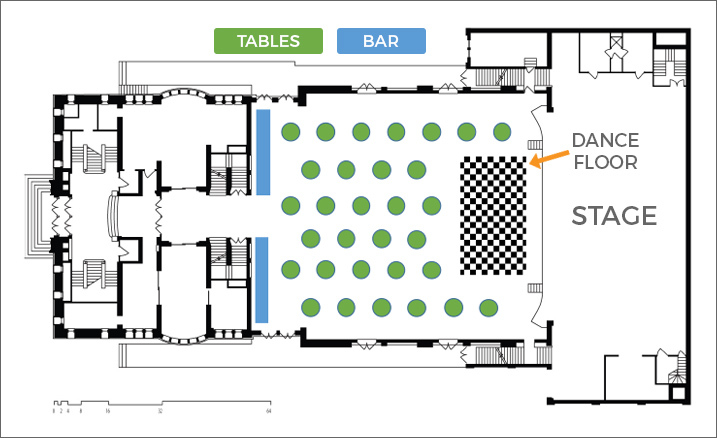 1st Floor/Stage – Removable seating. 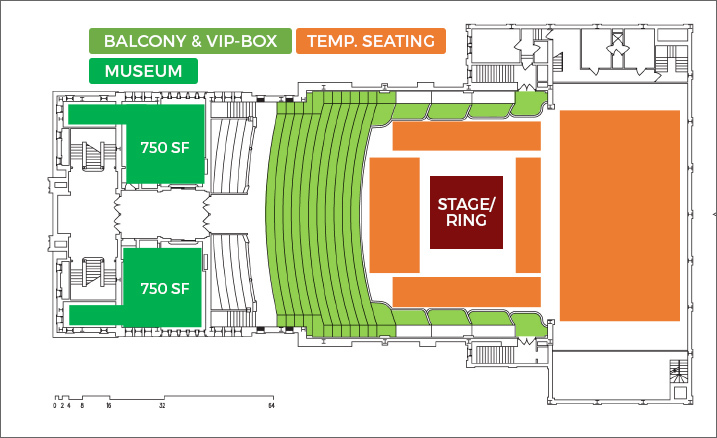 2nd Floor – Seats will remain. 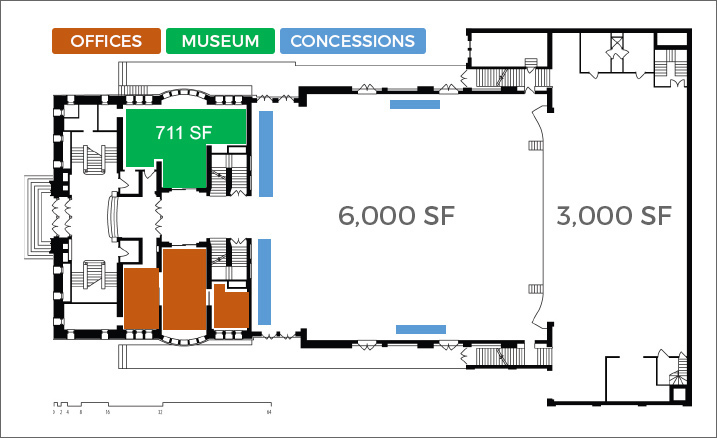 3rd floor 5,000 sf dome ballroom will contain museum artifacts while doubling as an event space. 12,000 sf of useable basement, 17 foot high ceilings and windows in most rooms. Ideal location for centerpiece local history museum. Join us at one of our events to learn more about the Irem Temple Restoration Project and how you can help to preserve the history of downtown Wilkes-Barre. Download our Sample Letter to Elected Officials and PowerPoint PDF below. Our group is solely dedicated to creating a sustainable non-profit, that will save this amazing building and repurpose it in a way that drives local economic growth. Available for purchase are signed and numbered artist renderings of the Irem Temple. Each of the limited quantity renderings will be numbered and signed by artist Phil Hamilton. We also have t-shirts available for purchase. Please show your support and purchase your merchandise today! Order From Our Store Here! The Irem Temple Restoration Project (ITRP) and the Wilkes-Barre Preservation Society will be hosting a Public Square Pop-Up at One South Main Street (Floors 3 and 4) in Wilkes-Barre. The Pop-Up will feature items that tell the story of our area’s incredible history. The goal of this museum is to showcase the full breadth of our history and to demonstrate that heritage tourism can be a shared source of prosperity. A thriving heritage tourism industry can have a significant positive economic impact on our community as well as a positive social impact by reinforcing identity and pride. An improvement in the economy will reduce crime and foster a more ideal work environment, making the Wyoming Valley a coveted place to live. The Pop-Up will be free to the public and will open in December 2018. Please check our Facebook page for more information about the Opening Day Celebration! We are still looking for local business sponsors. If you are interested in learning more about our sponsorship levels, please contact beth@iremtemplerestorationproject.com. Sponsors will be featured on our 9’ x 7’ windows overlooking Public Square for the duration of the Pop-Up. If you are interested in volunteering with the Public Square Pop-Up, email beth@iremtemplerestorationproject.com. 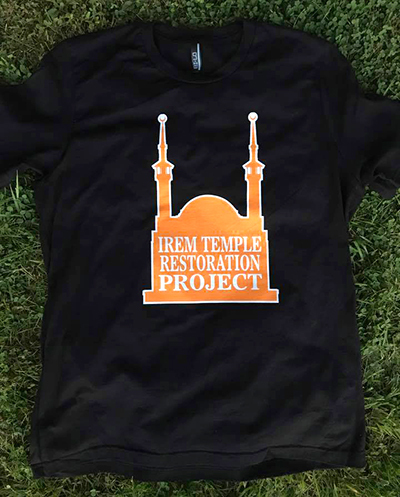 Join the Irem Temple Restoration Project Street Team! We believe that our message is an important one and want everyone to hear it. With the community’s support we can build heritage tourism, create a boom in our local economy, and share with others why we are so proud to call this place “home”. Being a part of the ITRP Street Team means you will take an active role in making this project a success. You will receive emails from us when your help is needed for specific ITRP events and fundraising campaigns. Sign up to help whenever you are available. We will enable and empower you to search for and create opportunities to share the ITRP’s message. We will provide all the materials and information you need to go out into your community and share information/fundraise for the ITRP. Begin today by searching for prospective locations to operate an ITRP Pop Up Booth. You can approach local businesses, such as your local library, or look for upcoming events, like farmer’s markets, that will host you and your pop up booth. You can even share information about the ITRP with family or groups/clubs you belong to. If you are interested, please download and complete the form below and share your ideas with us! Once it is approved by ITRP leadership, we will give you everything you need to be successful. If you’re looking for a street team member to attend your event/gathering and share information about the ITRP, please contact beth@iremtemplerestorationproject.com.